In October, the U.S. Department of Energy (DOE) declared two large swaths of the country “National Interest Electric Transmission Corridors” (NIETCs). In these regions, the federal government would have the authority to overrule local and state regulations and control and to grant permits for the construction of transmission lines even over the objections of the state and local governments. Needless to say, there was a dramatic uproar in the regions declared NEITCs, and I wrote a four part examination of the Energy Policy Act of 2005 (EPAct) that gave the DOE this authority over at Scholars & Rogues. In response to the uproar from the public and several states, the DOE has agreed to re-open hearings on the designations of the Mid-Atlantic and Southwest NEITCs. The Pennsylvania Utilities Commission even filed suit in federal court to block implementation of the corridors, saying that they were “beyond the scope intended by Congress (from link above)”. Given the language of the EPAct itself, there is literally nothing to prevent the DOE from doing exactly what it did, protestations about how “[t]he final northeastern NIETC designation plan was not altered from a draft plan released earlier this year...” notwithstanding. Revisiting the decisions is good politics for the DOE - it shows that listen to public comment even though the EPAct doesn’t actually require them to do so. But just because it’s revisited doesn’t mean that the decisions will be scaled back or reversed. In fact, there’s no way to ensure that the DOE won’t conclude that they need to expand the NIETCs due to updated information on where power is required. The vague and overly-broad language of the EPAct itself is the problem here, not the designations themselves. Had the EPAct been better written, the DOE wouldn’t have been given overly broad powers in the first place. And attacking the NIETCs in federal court will almost certainly fail for the same reason - Congress gave the DOE this authority, and nothing in the act itself places sufficient limitations on the DOE in how they exercise their new authority. The states and counties who have been designated part of one of the two NIETCs would be best served if they lobbied their various federal legislators to have the blanket authority given to the DOE scaled back, something that I have yet to see evidence of. I’m an avid reader and movie watcher, and I enjoy the occasional escape into things that aren’t hard to read or understand. This is why I’ve enjoyed the Harry Potter novels and why, when it was suggested to me a number of years ago, I read the entire His Dark Materials trilogy by Phillip Pullman. 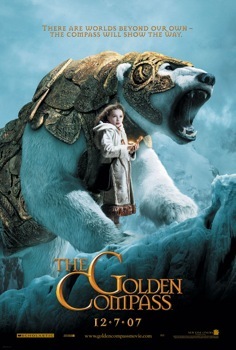 The first novel, The Golden Compass, has been made into a movie that officially hits the theaters this Friday. And, if the sheer volume of news about the movie is any indication, it will be the blockbuster of the 2007 holiday season. The reason is that a number of Christian groups (mostly Catholic) have demanded that their adherents boycott the movie, and in so doing have given it a massive amount of free news publicity. Have these people learned nothing? Seriously, the best way to guarantee that people expose themselves to something is to ban, boycott, or otherwise protest it. The more people who hate something and want you to hate it too, the more other people want to figure out what all the fuss is about. It’s human nature. And so the Catholic League, iPrayToday.com, and at least one Christian talk radio host have demanded that no-one see the movie. News outlets as diverse as France’s AFP, The National Catholic Reporter, the Arab Times Online, CNN, and and The LA Times are reporting about the controversy surrounding the movie as much as they are about the movie itself. A huge number of commentaries, mostly in support of the movie, have been put out by supporters including several written by Catholics. Two of the better one’s I’ve read are Salon’s “A moral ‘Compass’, written by Catholic mother Mary Elizabeth Williams, and The Boston Globe’s “God in the dust” by Catholic theologian Donna Freitas. I’ve read the books, and there’s definitely an anti-organized religion and anti-authority theme to them. There’s also no question that the Authority (the books’ version of God, albeit a false one of a sort - saying too much more would give away too much of The Amber Spyglass) is the bad guy and that he is dead by the end of the trilogy. But personally, I’m right there with both Ms. Williams and Ms. Freitas - if your faith can’t stand up to being questioned, it’s not much of a faith. Unfortunately, while all this press has given The Golden Compass a lot of free publicity, it’s also given the Catholic League a lot of free press too, and that’s not necessarily a good thing. Bill Donahue, the Catholic League’s spokesman, has a history of being anti-woman, anti-gay, and generally an over-wrought ultra-conservative blowhard (read a number of “good” Donahue quotes here). People like Mr. Donahue thrive on attention like this, and in the process get more and more dangerous. But in the process they open themselves up to eviscerating satire like that dished out by South Park in last season’s Easter episode, “The Hare Club for Men”. Thoughts in the Daedalnexus is a project of Brian Angliss, webmaster of The Daedalnexus, MegatokyoBGC.net, and contributing member to the Livejournal community The 5th Estate. Welcome to my blog. With a little luck, you'll find yourself alternatively amused and infuriated, but always enlightened.